Ivy brings to mind vine-covered cottages, lush gardens and mossy urns with trailing vines. But for some gardeners, ivy only brings on headaches. 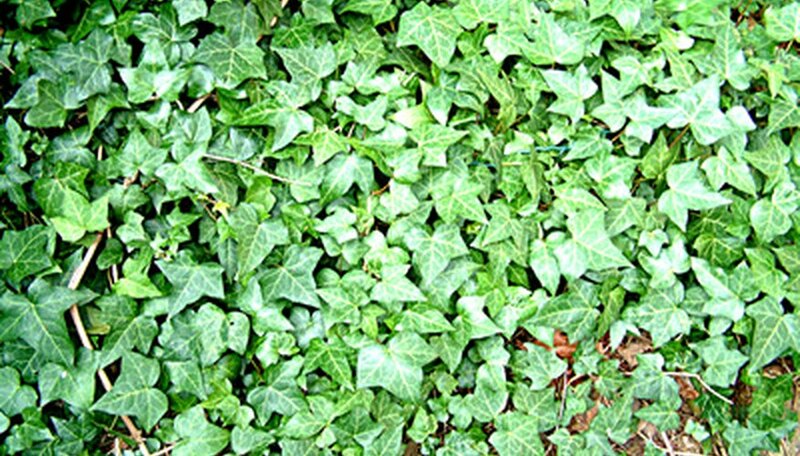 When ivy is used as a ground cover, it can quickly overtake a garden, smothering other plants, blocking out the sun and damaging grout between bricks or stones. It is not easy to kill, but hand removal and some chemical help will eventually beat back this tough plant. Use a de-thatching rake to remove as much of the plant as you can by hand. The rake cuts into the soil and pull out the larger clumps. Do not compost any of part of the ivy; dispose of it in the trash or yard waste recycling. Apply a 2,4-D based herbicide or glyphosate herbicide. These herbicides are broad spectrum, which means they will kill any plant that receives the spray. Cover any plants you want to protect with a piece of cardboard to avoid spraying them. Do not spray on a windy day. Paint stems and new shoots as they appear with the herbicide. When the plant dies back, remove all the roots and tendrils that remain. Apply borax as an alternative to the herbicide. While boron, the main ingredient in borax, is a vital nutrient for plants, an excessive amount is toxic to ivy. Do not over apply, as too much can contaminate the soil and take years to leach out. Dissolve 8 oz. of borax (found in stores' detergent aisle) with 4 oz. of warm water. Add the mixture to 2.5 gallons of water. Spray over 1,000 square feet of the ground cover you want to kill.